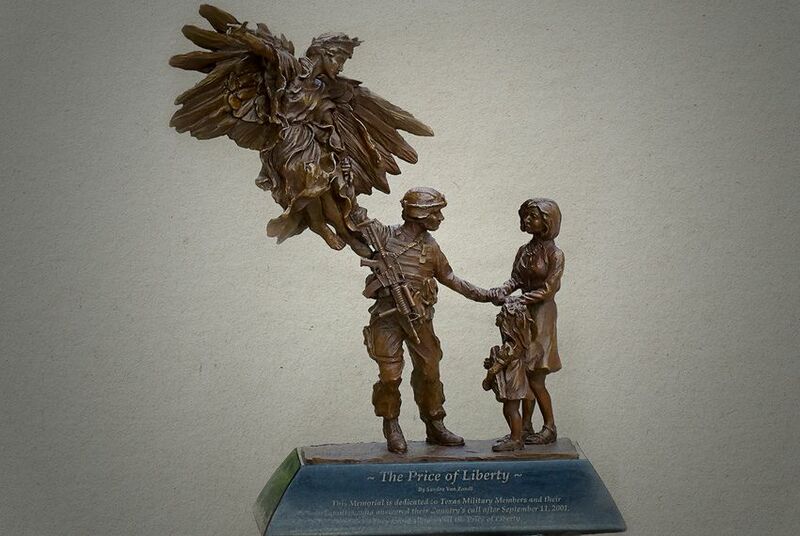 The bronze, 20-foot tall “Price of Liberty” monument has been in the works since 2015. To personalize the monument, the artist modeled the angel pulling at the soldier after the Lady Liberty statue on the Capitol dome, and labeled the soldier’s uniform “Houston” as a dedication to the home of the monument's large funders. The base of the statue will feature dog tags that Van Zandt had families and service members adorn with the name of a soldier or a prayer. Stryker approached Van Zandt after seeing some of her work in Tomball — such as her monument to Thomas Henry Ball, a former U.S. congressman and father of the Houston Ship Channel. Van Zandt has created several other historical and military monuments that stand mostly in Texas and Oklahoma. In Austin, she has a "Freedom is Not Free" sculpture of American Bald Eagles in the lobby of software company Overwatch Systems.